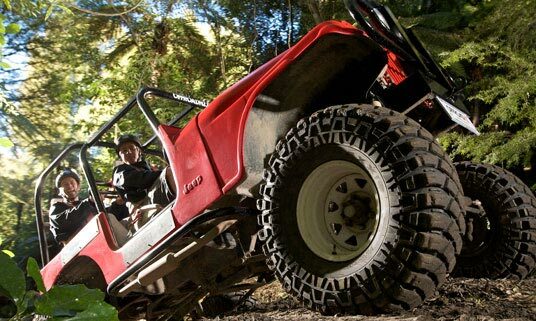 Off Road NZ has recently completed a new thrilling monster 4x4 track, through New Zealand native bush. Off Road NZ is set on 135 acres of farmland, 35 acres of this land is used for farming and the other 100 acres is for you and us to play on! Utilising tracks left from logging operations early last century, the Monster 4X4 Thrill Ride Track is set amongst beautiful native NZ bush. As you are hanging on your driver will put this amazing vehicle to the test tackling obstacles such as the Loggers Longs Drop, the Widow Maker, the Roll Me Over and the Log Climb!